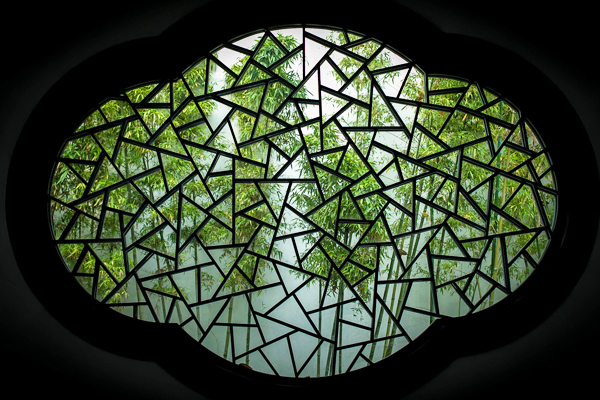 The kaleidoscopic window is an important architectural feature distinguishing the classical gardens of Suzhou from others. 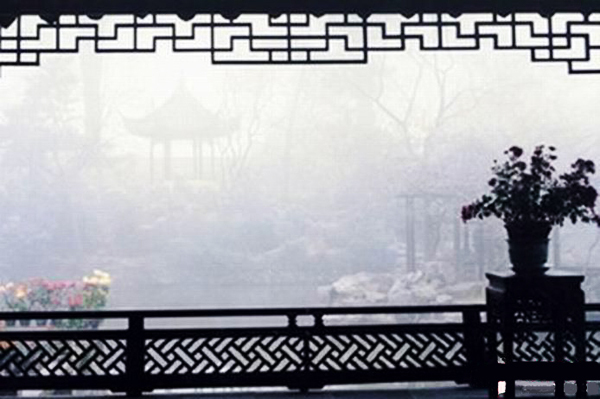 If I compare the Suzhou gardens to a poem, the changeful windows are the eyes of the poet. From the insightful eyes of the poet, I saw the most fascinating scenery in the poem. Inlaid the walls and doors, each of them make the gardens so unique and alluring. I must say that, I was able to have a view of charm of time-honored Suzhou only from them. 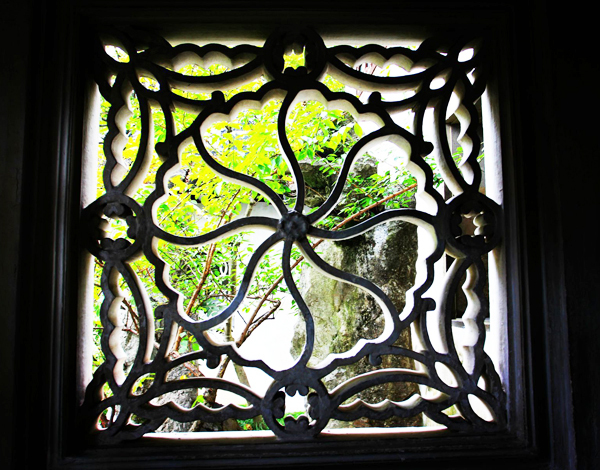 The perforated window is one kind of window with ornamental patterns. It mainly aims for “leaking scenery” and some of them also do help for ventilating and daylight. Looking from these windows, the scenery become rather touching. As I made a step, the scenes my eyes caught from the windows shifted, terrifically amazing! Based on different material, the perforated windows can be divided into wooden windows and stone windows. I found the most wooden perforated windows in the Lingering Garden and most stone perforated windows in the Blue Wave Pavilion. In fact, there are 108 stone perforated windows with different patterns in the Blue Wave Pavilion, but I never felt visual fatigue while appreciating them. There are 4 different types of pattern in the perforated windows. These patterns not only make the windows more interesting and beautiful, but also carry good meaning. Geometric Patterns include straight lines, arch lines and the combination of straight lines and arch lines. The straight lines make the patterns simple and decent, representing the owners’ upright and integrity. The arch lines are more lively and vivid, like fish scale, coin shape, ripple etc. 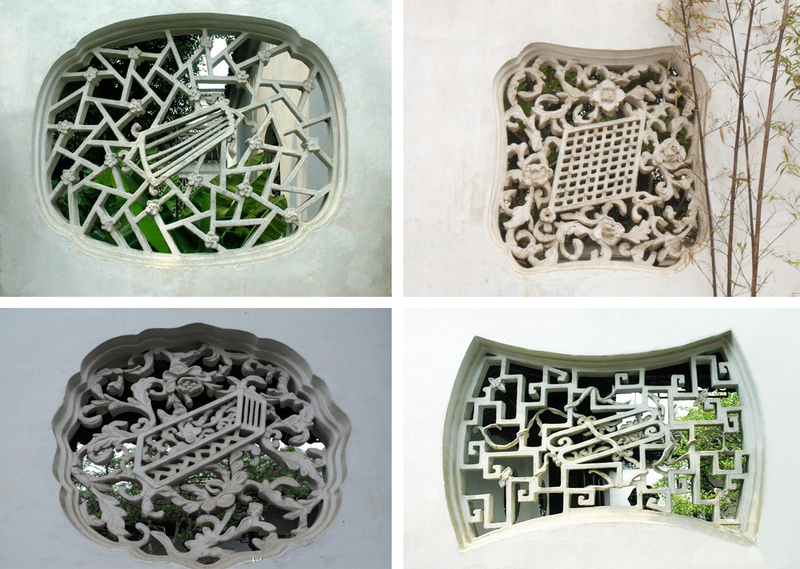 Nature-themed patterns (plants and animals) are easy to find in the perforated windows in Suzhou gardens. In Chinese culture, every flower and animal has its own meaning. 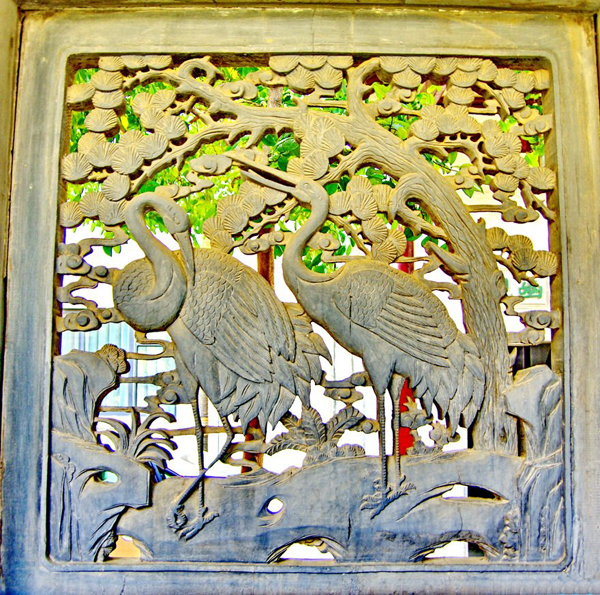 Bat and magpie mean good fortune, Pine tree and crane represent longevity, plum blossom stands sinlessness and phoenix mean wealth…According to the owners’ inclination and aspiration, the gardeners wound add corresponding patterns. The article-themed patterns mainly are vases, cornucopia, writing brushes, ink sticks, paper and inkstones which also show the owners’ different pursuit. 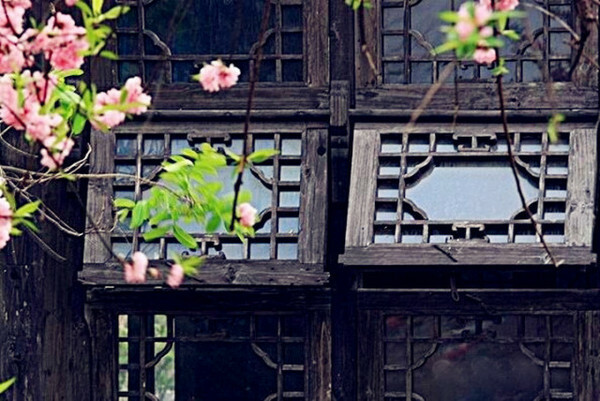 Taking the Lion Grove Garden as an example, a set of windows named “four elegance” including Chinese Zither, checkerboard, book and picture scroll is a classical artwork in Suzhou gardens. It adds much fragrant flavor of learning to this lively joyous garden. Apart from lines, plants, animals and other articles, there are also several perforated windows with lifelike human characters. Most of the characters are chosen from the legendary, Buddhist sutra and drama works. The people-themed patterns pay more attention to the technology of carvings. In addition to ubiquitous perforated windows, the window openings (window frame without any pattern or glasses) are also a watching focus. With the window opening, the room or corridor can enjoy better daylight. What’s more, it plays a key role in “framing scenery”. It looks like a tailor-made picture frame which captures picturesque vistas beyond unexpectedly. These openings might be round, oval, hexagonal or octagonal, or in the shape of a vase or a piece of fruit. Sometimes it has highly ornamental ceramic frames. The window may carefully frame a branch of a pine tree, or a plum tree in blossom, or another intimate garden scene. In order to avoid creating a feeling of the stiffness by the wall, the skilled gardeners always choose the screen windows to break up the space. Screen Windows in the gardens are usually made by filmy silk which seems soft and exquisite. Embroidered with birds, flowers or other landscape, the screen windows imply the cultural connotation of Suzhou. In the Celestial Hall of Five Peaks of the Lingering Garden, I saw the remarkable screen windows embroidered with painting and calligraphy. 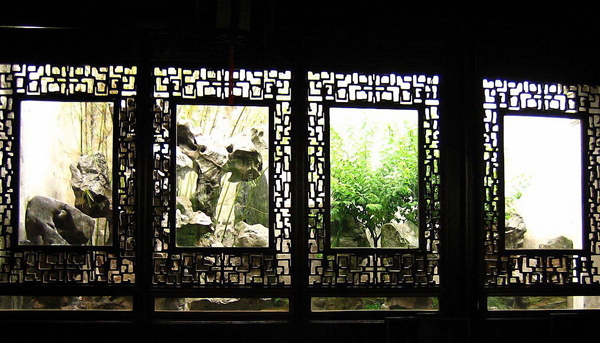 Removable Window is a kind of windows only widely used in the classical gardens of Suzhou. It often contains three parts in a vertical line. You can open the upper two parts from their bottle side and then use the corks to support them. The lower part can’t be moved. This kind of window was designed ingeniously. From the three parts, I saw the varying scenery because of the different distant my sight could reach. Full of spirituality, poetry and romance, the changeful windows left a lasting impression in my heart. 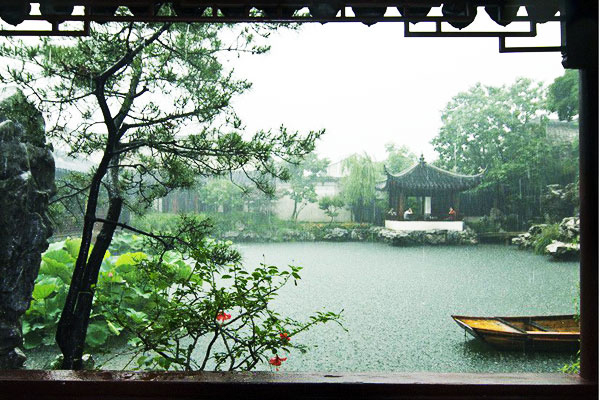 Open your windows to soul and touch this splendor hidden in Suzhou. 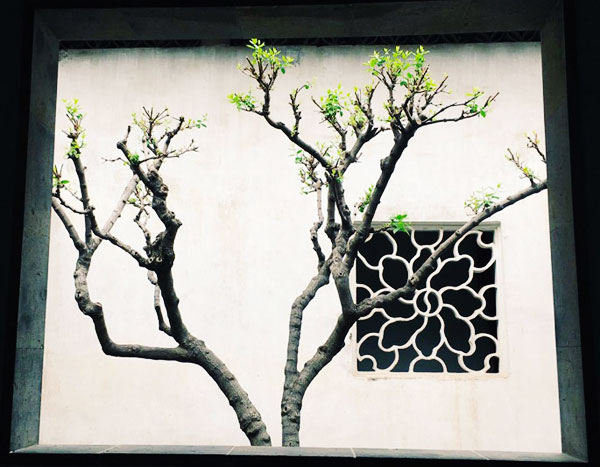 If you are interested in more Suzhou Tours including elegant Suzhou Gardens with spectacular windows, you can head to our Suzhou Tours with different experiences. Feel free to contact us if you need any help. This entry was posted in china tour, suzhou tour, travel guide and tagged Suzhou Gardens, Suzhou Tour by Travel Expert. Bookmark the permalink.